Toceranib is a receptor tyrosine kinase inhibitor and is used in the treatment of canine mast cell tumor also called mastocytoma. Together with masitinib (Kinavet (US)/Masivet (EU/ROW) by AB Science), toceranib is the only dog-specific anti-cancer drug approved by the U.S. Food and Drug Administration. It is marketed as Palladia as its phosphate salt, toceranib phosphate (INN) by Pfizer. It was developed by SUGEN as SU11654, a sister compound to sunitinib, which was later approved for human therapies. 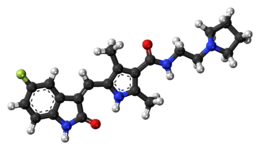 Toceranib is likely to act mostly through inhibition of the kit tyrosine kinase, though it may also have an anti-angiogenic effect. ↑ London CA, Malpas PB, Wood-Follis SL, et al. (June 2009). "Multi-center, Placebo-controlled, Double-blind, Randomized Study of Oral Toceranib Phosphate (SU11654), a Receptor Tyrosine Kinase Inhibitor, for the Treatment of Dogs with Recurrent (Either Local or Distant) Mast Cell Tumor Following Surgical Excision.". Clin Cancer Res. 15 (11): 3856–65. doi:10.1158/1078-0432.CCR-08-1860. PMID 19470739. RET inhibitors: Vandetanib (also VEGFR and EGFR). Entrectinib (ALK, ROS1, NTRK). c-MET inhibitor: Cabozantinib (also VEGFR2).